Steven Miller earned the nickname "Professor Plumb" for coming top of his class at college and the name stuck. 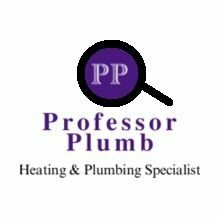 Steven is a qualified plumber, GAS SAFE registered heating engineer and a HETAS registered expert in solid fuel stoves. Rochdale born and bred, Steven believes in supporting local businesses and supplies locally sourced quality products and equipment. Steven was born and bred in Rochdale and is committed to supporting local community and local charities. Steven's hobbies include cycling, singing, keeping chickens and renovating Morris Minor cars. With a background in Banking & Finance, "Shiv" organises the office and spends any spare time horsing around! Storm was rescued from a River Roch storm drain. She is very sociable and is in charge of meeting and greeting! Rosie was rescued in Ireland. Steven and Shiv continue to support Animal Heaven Animal Rescue in County Kerry!